Oh! 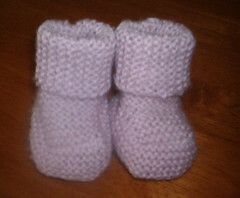 Baby Baby Booties - RYC Cashsoft DK - Color Sweet. I thought they were pretty cute, and pretty easy. Although the way the patterns written it leaves about 15 ends to weave in. I found it much easier to do it as I went. Well, off to work on my scoopy cardi. Write more later!